Have iTunes installed or a video iPod? Download the iTunes version. Windows users: right-click and choose "save as." Mac users: hold down the control key, click and then choose "save as." Sharks under seige! 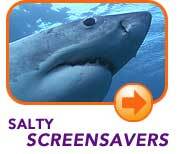 Help save sharks like the great white in this Flash game. 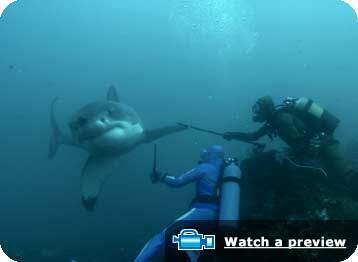 Vanishing Sharks Investigate why sharks are disappearing and watch the possible effects on our ecosystems. The truth about shark attacks. Jean-Michel Cousteau comes face-to-face with the awe-inspiring great white. Turn your desktop into an ocean adventure. Page updated 7-05-06. © 2006-2009 KQED and Ocean Futures Society. All rights reserved.